OASIS (Organization for the Advancement of Structured Information Standards) has a suite of smart grid price communication and transaction standards in development and public review. TeMIX is a profile (subset) of the OASIS standards. The Smart Grid brings advanced information technology to the electric power industry. TeMIX provides the price communication and transactive foundation for Smart Grid applications. A grid cannot be smart unless all tenders (price offers) and transactions are clearly communicated, recorded, executed and paid for and each party has full access to tenders and can transact in its own interest with other parties. ♦ TeMIX Inc provides training, product design and advisory services to developers of devices and services that can benefit from participating in a smart grid using TeMIX messaging. ♦ TeMIX Inc provides training, rate design and advisory services to regulated and competitive retailers of electricity to implement innovative customer service plans and tariffs. Contact Dr. Ed Cazalet at ed@temix.net to discuss your needs and ideas. TeMIX Platform cloud based services are deployed incrementally expanding from a single customer or feeder to an entire grid. The TeMIX Platform's computer and communications resources for large deployments expand only in proportion to the number of nodes, customer, generation, and transmission elements cordinated. This provides huge savings in contrast to conventional dispatch and control methods for large grids. The Temix Platform interfaces naturally with standard distribution and transmission grid models that characterize the current state and constraints of the grid. "TeMix makes electricity dynamic price communication and transactions easy." TeMix Inc. and Universal Devices Inc. are piloting a Retail Automated Transactive Energy System (RATES) on the Southern California Edison distribution grid with the sponsorship of the California Energy Commission. For more information click on the RATES tab above. transactions to guide investment and operating decisions. from centrally planned to a decentralized energy ecosystem. • There are two products: energy and transport services. • Spot transactions are used to coordinate operating decisions. • All parties act autonomously. This book is about applying fundamental business concepts to move our electric power markets to a new paradigm. The hear of the new paradigm is the use or forward and spot transactions to guide investment and operating decisions. The current paradigm is regulated cost-of-service and centralized resource optimization. 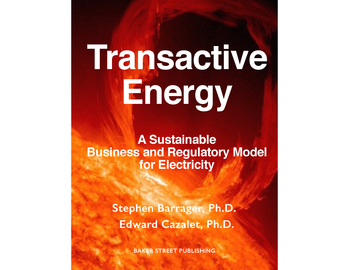 This old paradigm will give way to the new model as the electric system evolves from centrally planned to a decentralized ecosystem. .
Our am by writing this book is to expedite Transactive Energy as the normal way of doing business -- globally. Transactive Energy is the keystone of an efficient, fair, and transparent electric power system. iBook is best on the Apple iPad and Mac but it is also available on PCs and Kindle readers at Amazon. 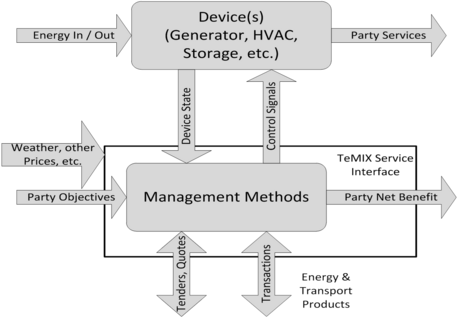 TeMix uses simple, standard tenders and transactions for electric energy among the connected parties. The TeMix Platform is a cloud-based service of TeMix Inc. serving all participants in regulated and competitive electric power markets. The TeMix Platform. can be deployed securely, reliably and globally at low cost. The TeMix Platform is highly scalable from thousands to hundreds of millions of participants. 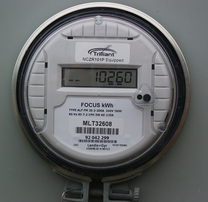 TeMix Inc. provides Transactive Energy messaging and other services under various service plans. TeMix is a standards based approach to Transactive Energy on the smart grid. Applications include price responsive demand using dynamic prices and price responsive automated smart devices. TeMix can greatly reduce bankruptcy risk and capital requirements for electricity retailers. Copyright © 2011 - 2017 by TeMix. Inc. All rights reserved.